In late 1998, I had begun transitioning from brewing to beer sales, but I hadn't quite realized it. I had recently left my position at the Local Brewing Company and was sending out quite a few resumes. In the cover letters, I would answer the question, asked or unasked, "Why do you want to brew?" Beer was a calling for me, I wrote, both the liquid itself, and the social message for which it could be an avatar. Brewpubs and breweries should assist in revitalizing bereft urban areas, by providing employment, social glue, and physical beauty. Needless to say, I received few positive responses. Nearly 10 years later, I've seen a lot of that force for positive change —which was almost messianic in the beginning of the craft beer movement— become spent or become unmasked as simply business for avarice sake. I personally haven't surrendered ... yet. Beer remains to me not merely a "product", or as one wholesaler put it: "boxes". Rather, beer —in its "nobility", as the late great Michael Jackson put it— can and should be a locus for good. 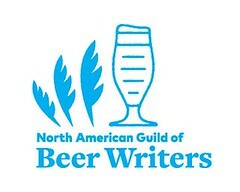 But now in 2007, I understand in more lucid fashion that it is the people who of beer who define beer's nobility. There are many brewers who ply their craft in tempered semi-obscurity. There are others on the sales side, who can do the same. Let me acknowledge one: Steve Harrison. Steve Harrison was the Director of Sales for the Sierra Nevada Brewing Company. He died in mid-August. Harrison, in fact, was the very first employee of the Sierra Nevada Brewing Company, itself the original surviving brewery of the craft beer movement. In his influential position, he helped shepherd the nascent fad into a mature business. He truly was one of craft beer's pioneers. 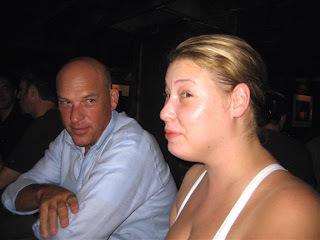 I only met him once —at the Brickskeller in Washington, D.C.— but I definitely knew of him. Many outside of the beer business did not. Steve’s role evolved from sales to a role blending the sales department with operations and production planning. Steve was the first to put together a national craft beer distribution network, the first to study and understand the crazy patchwork of state alcohol laws in all 50 states. Craft brewers have followed, but not to the scale of Sierra Nevada under his stewardship. He was intensely interested in politics, and was committed to progressive causes related to social justice, environmental sustainability, smart growth, economic opportunity, and universal health care. Steve enriched the lives of all those with whom he shared himself, worked, and biked. His good humor, companionship, helpfulness to others, and social commitment will be greatly missed. I mentioned this to someone in the beer business, who whispered back to me of "rumors". How utterly he had missed the point: the powerful example of Steve's life. Donations in his honor may be made to the Steve Harrison Fund, which will be used to promote environmental sustainability and alternative energy projects. Donations may be sent to Newton-Bracewell Chico Funeral Home of Chico, which is handling arrangements. Beer (and whisky) writer Michael Jackson has died. He had been suffering from Parkinson's Disease for several years. Jackson was a tireless promoter of good beer, and it was through his written words —inimitable, erudite— that he introduced the joys of that good beer to others. He was a trail-blazer of the concept of beer styles, whether by history, geography, process, or flavor. Prior to his promulgation, there had been very little formal recognition of such differences. The modern theory of beer style is largely based on the work done by Michael Jackson in his 1977 book The World Guide To Beer in which Jackson categorized a variety of beers from around the world in local style groups suggested by local customs and names. He wrote with a newspaperman's concise prose, enlivened with wit and a sense of beauty. Decades after he began his mission, we can enjoy a good beer as not only something miraculous, but as a part of the woof and warp of everyday life - albeit an exceptional part. Jackson's promotion of good beer throughout the world was incalculable in its positive impact. I don't believe it will soon be equaled. Jackson will live on through his words as a bard of beer. That was and continues to be his special gift to us. 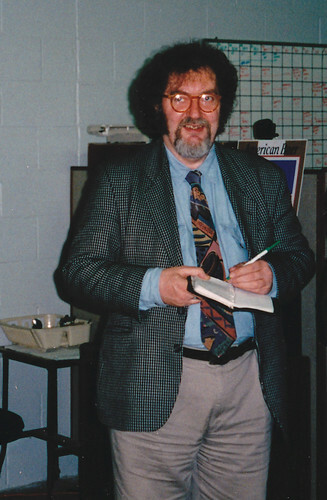 Read his final column for All About Beer Magazine, which will be published posthumously. 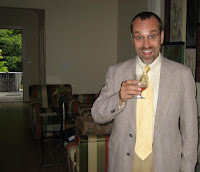 Fellow beer writer Lew Bryson toasts Mr. Jackson. Tom Sietsma can be tough on restaurants in his Washington Post reviews. But in his First Bite column, he often gives the benefit of the doubt to newly opened spots. 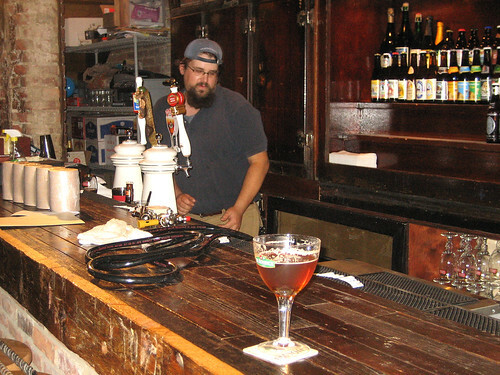 And so he was today: A Brussels-Like Alehouse, at Home on H Street, his introductory piece on Belgian-themed Granville Moore's. He notes one negative: the brasserie's original chef has already been replaced. But as good as Granville's double-fried frites (aka French fries) may be, I give the nod to those at Brasserie Beck, and top honors to the garlic fries at Baltimore brewpub Brewers Art. The brew is a light, crisp, unfiltered ale that leaves a peppery finish on the tongue and makes a good companion to a pot of mussels. The Washington Post ran a story today about proposed beer labeling requirements. Some of this might be construed as government backlash towards the rampant alcohol augmentation occurring in craft beer. For example, a 12-oz beer at 18% abv is huge compared to a beer of 5% - in terms of alcohol, calories, etc. Several states, such as North Carolina, already require indication of alcohol percentage by volume to be placed on a beer's label, if not other nutritional content. The predicate analysis must come from an independent laboratory, even for breweries with the necessary (expensive) lab testing equipment. Charges range from $75 -$100 for an analysis of alcohol, calories, protein, and carbohydrates. Until the mid-1990s, the government ironically forbade breweries from listing the alcohol percentage on beer bottles while, at the same time, requiring wineries to do so! The Post's beer column on beer appears bi-monthly in the Wednesday Food Section. It's written by Greg Kitsock, who is also the editor of the Mid-Atlantic Brewing News and the American Brewer Magazine. This is fun: a taste test of veggie burgers. I go for #2 and then #3. #1, the Morningstar has too long of a mad food scientist's ingredient wish list. No need to eschew meat while supporting the barons of Strangelove industrial mega-food. For home-made, I like Isa Chandra Moskowitz's recipe for veg patties: it addresses the crumbly problem. And here's another good recipe I've also tried (tasty although definitely crumbly). It contains a useful warning about using the George Foreman grill for veggie burgers. You can't! Most will crumble and stick into a mess. When I lived in a group house, I was the designated veggie-burger-maker. I would construct mine out of black beans, bread crumbs, tofu, and a vegetable. Once, I used habaneros - a lot! - as the vegetable. The things were so nuclear spicy, that none of us could get through an entire burger. So, I divided each into small portions, stored them in the freezer, and pronounced them breakfast sausages. That worked! But the supply still lasted for awhile. There's a DC restaurant that makes its own black bean burger - very tasty. At the moment, I can't remember which it is; I'll update/edit when I do. Call 'em veggie pancakes and you'll get past this problem: "but they aren't burgers!" It's the celebrity chefs and the celebrity authors, who, within their ambits, get all the attention. And, so it is with brewers. Not to begrudge those who get most of the attention, but there are many brewers, working semi-anonymously at brewpubs and breweries throughout the nation, who are creating beautiful beers. For 9 years Scott Dietrich worked at the Clipper City Brewing Company, as a brewer and lead brewer. Under his aegis, Clipper City beers, such as Winter Storm Imperial ESB, Small Craft Warning Uber Pils, Red Sky at Night Saison, and, one of my favorite session beers, Clipper City Gold, received many accolades. While at Clipper City, Dietrich was instrumental, as well, in the recipe formulation and production of The Raven Lager, a German-style export lager. In early 2006, Dietrich moved south and signed on as a brewer at the Miller plant in Eden, North Carolina. Word out now is that he has returned north and accepted a position at Pennsylvania's Victory Brewing Company. I've been informed that Dietrich has been hired as Director of Brewing Operations. 5:15 am. See the penumbra of the lunar eclipse. The top 40% of the moon is grayed out. 5:40 am. The upper 95% appears obscured. The lower disc looks blood orange. 5:45 am. Clouds hang low on the horizon and obscure the moon. And then the sun rises. No more viewing, but it was amazing for those few minutes. The next total lunar eclipse - and, again viewable in North America - returns on 21 February of next year. A lunar eclipse occurs when the earth is interposed between the sun and the moon, darkening the moon's disc (as opposed to a solar eclipse when the moon is set between the earth and the sun during daylight, blocking out the sun). Dan Steinberg in his D.C. Sports Blog on Monday proffered the tantalizing possibility that, next year when the Nationals move to their brand spanking new digs on South Capitol Street, there is a possibility that maybe, just maybe, there might be better food, and ... GASP ... local beer! Had breakfast this morning with friends Dave and Karen at Perly's. Voted best biscuits in Richmond. Later this afternoon, I'm back for the 2nd day of the Shockoe Craft Beer Festival in downtown Richmond on the Kanawha Plaza. The weather service is calling for 105 ºF in the shade. I'll be at the Clipper City Brewing Company booth, pouring our Loose Cannon Hop3 Ale and Small Craft Warning Uber Pils. 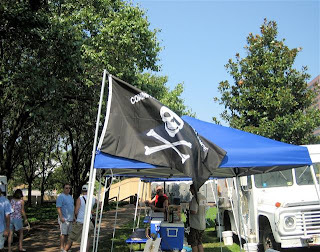 Stop by and say hell o (we're under the shade trees). Across from our booth was one of the the festival's food vendors: Mise En Place. Chef Wansleben was braising green peppers and onions in beer, and, of course, cooking the brats, in beer -from local brewery and festival sponsor Richbrau. Her school hosts an annual class on cooking wild game in beer. She enjoys seeing its wide range of attendees: hunters to suburbanites to suits. 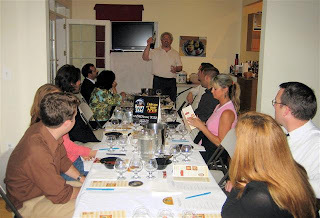 I've been at some wine-centric events where I or Clipper City Brewing have been the only beer representative. Thus it was fun - and fair play - to find one wine representative at a beer festival. Here at the 3rd Annual Shockoe Craft Beer Festival, that was Barboursville Vineyards, represented by their Marketing Director, Jason Tesauro. In dramatic fashion, Jason popped off the cap off a bottle of Barboursville Sparkling, literally severing the bottle neck with the blunt edge of a sword. It was tasty bubbly; and I've been a fan of the winery's delicious red blend Octagon for several years now. This was my first attempt at posting a video to my blog. Apologies: The vid was taken sideways; I need to work on my video editing. But you'll get the picture, so to speak. 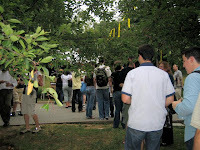 Click for more fest pix. A long line never let up at the Clipper City Brewing Company booth at this year's Brew at the Zoo. Festival Manager Nicole Popovich said over 1700 people enjoyed beer and food from local brewers and restaurants (and beers from farther afield), to benefit the National Zoo. This year, the event was expanded, neatly spread out over two meadows near to the Lion/Tiger Field. As we were setting up our booth, a lion was bellowing, very insistently and loud, in the area just behind our tent! Did he want beer? Many brewpubs in DC area either cannot distribute their beer outside of their restaurants, or logistically choose not to. Thus it was great to see them represented here: Gordon-Biersch, Rock Bottom, Capitol City, Sweetwater, District Chophouse. Here's the complete list. It was interesting to see Fordham and Dominion as new buddies, side by side. West coast Widmer, also being in the Anheuser-Busch network, was right there as well. Capitol City Brewing Company, The District Chophouse and Brewery, Wild Goose Brewery, Clipper City Brewing Company, Great American Restuarants (Sweetwater), Rock Bottom Restaurant and Brewery, Hook & Ladder Brewing Company, Shenandoah Brewing Company, Gordon Biersch Brewery and Restaurant, Fordham Brewery, Old Dominion Brewery, Widmer Brothers Brewing, Boston Beer Company, Sierra Nevada Brewing, Harpoon Brewery, Brewery Ommegang, Magic Hat Brewing Company, Anchor Brewing Company, Dogfish Head Brewery, F.X. Matt Brewing Company (Saranac), Abita Brewing Company, Allagash Brewing Company (represented by Global Brewers Guild), Victory Brewing Company, Rogue Ales, North Coast Brewing Company, Belekus Imports (Chimay) , and some international style lagers, such as Peroni, Nastro Azzurro, Cristal, Cusqueña, Aguila, Pilsner Urquell. The Reef Restaurant, Tryst, The Diner, Open City, Cabot Creamery, Lebanese Taverna, Chef Geoff’s,Lia’s, La Tosca, Best Buns Bread Co., Crystal City Sports Pub, Perrys Restaurant, PS 7, Java Green, Café Deluxe, Zengo, and Tonic. Greg Jasgur of Birreria Paradiso (l) and Tim Schliftman of the Wine Specialist (r) stopped by the booth and helped pour Clipper City's Oxford Raspberry Wheat and Loose Cannon Hop3 Ale. Between the two is Kristin Orr of Legends, Ltd., our wholesaler in D.C. She graciously assisted for the entire festival. Thanks! In 1897 - that is 1897 - the Chicago Colts National League baseball team (who??) beat a National League team from Louisville, Kentucky by the score of 36 to 7. It took 110 years for a similarly lopsided score to recur in Major League Baseball. It happened last night in Baltimore as the American League Texas Rangers defeated the Baltimore Orioles by the crazy score of 30 to 3. Before the game, the Orioles had promoted interim manager Dave Trembley to Manager. Your next pint of Clipper City Gold is on me, Dave! 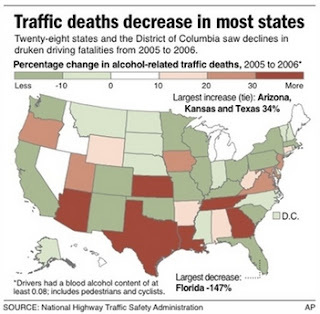 The number of traffic fatalities involving drivers with blood alcohol levels of .08 or higher decreased last year. It wasn't much of a diminution - from 13,582 to 13,470, 1% - but nonetheless, it was a decrease. The Associated Press headline today, however, is " Alcohol-related driving deaths up." How can that be? Keep in mind that alcohol-related statistics agglomerate together into one big number any and all traffic accidents and fatalities in which any amount of alcohol is involved in any way. For example, a 6-pack, unconsumed, in a trunk, could count towards this stat. This increase last year was one-half of 1%. Drunken driving is, of course, a bad thing. I'm not saying it isn't; I don't know of anyone who would condone it. But the MADD proscription encourages this unintended consequence: drinkat home, alone, rather than with others in salubrious conversation and fellowship. I've often said, in only half-hearted jest, that drunk-driving could be prevented by building more pubs. If more of us could walk to our local, fewer of us would drive there. In our drive-to, drive-in, drive-by society, a bit of a zeitgeist shift wouldn't hurt. Counting only the first 6 months of this year, sales of craft beer have surpassed 5% dollar share of total beer sales ... for the first time ever. That's 5% of the total dollars from all US beer sold; it's not the total amount of barrels produced. The craft industry had already surpassed that last percentage a few years back. Volume of craft beers sold this year is up 11% over the same period in 2006; dollar sales are up 14%. Jump here for the complete story. 5% of sales, while still small in the big scheme of things, is significant enough to partially explain the recent spate of big boy brewery buyouts of craft breweries, acquisition of distribution rights to imports, and other activities. It also points to a certain maturity in our craft-beer industry. Our $8.99 6-pack is not some country-club pricing but a realistic measure of how much it costs us to produce, market, and distribute our beers, and pay health costs and fair wages for those who make the beer (although as a friend who is a retail beer buyer often says: "Most of us didn't get into the beer business to get rich."). These statistics are compiled by the Brewers Association, a small brewery advocacy group based in Denver. And, as with any collection of data, there are interesting qualifiers and definitions. The craft beer industry is assumed to have begun in 1981. I really must remember to have my morning coffee before posting. I originally, incorrectly, had written that craft beer sales had surpassed the $5 million mark this year for the first time ever. Sales are much beyond that! I heard the sad news during my drive home from Atlanta. 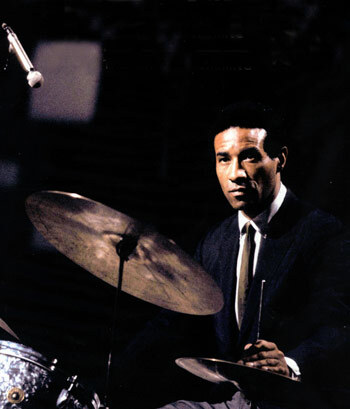 The great drummer Max Roach has died. As Dizzy Gillepsie put it, Max Roach was a musician first. He approached jazz rhythms in a contrapuntal manner; and he approached drumming as part of the melodic line. If not the originator, Roach was the seminal drummer for bebop and post-WWII jazz. With trumpet great Clifford Brown, Roach created several musically-important recordings in the mid 1950s, such as this eponymous album. My personal favorite album is one he recorded 3 decades later with his quartet of that time: Chattahoochee Red, a now out-of-print LP (never transferred to CD or digital tracks). The title track is simply gorgeous. Referring to Mr. Roach solely as a jazz drummer disregards the canon of his work. Percussionist might be a better appellation. He was active and influential in the civil rights movement of the 50s and 60s; with Charles Mingus he co-founded a record label. Read this appreciation. I saw Mr. Roach perform live only once: at Wolf Trap Farm Park. After the standard set, he dismissed the other musicians, and proceeded to play solo. He utilized his entire drum kit: every piece, metal stem, every wingnut. It was amazing, mesmerizing, and musical. The bank sign read 109ºF Tuesday in Atlanta, Georgia. 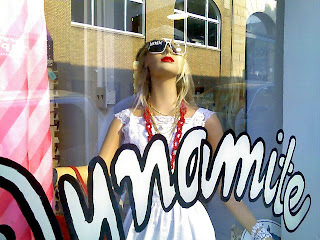 And this mannequin in a store window in nearby Athens was keeping cool sporting a Heavy Seas eyepatch. 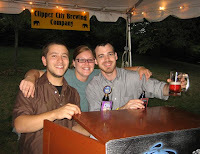 I was there, working the Atlanta area for Clipper City Brewing Company. On Thursday, there was no air-conditioning in the vehicle in which I drove around. By the end of the work day, I was hot and thirsty. So I headed over to the Brickstore Pub, a fabulous draft and bottle pub in the square in Decatur, just east of Atlanta. I didn't sample the food, which I'm told is quite good. I'll try the fare on a return visit. But I did sample the beers. Brickstore's bar is split between two levels. 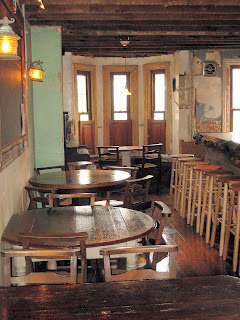 The downstairs is the main dining area, with several tap stations and two cask beer engines. The upstairs is more of a Belgian draft beer bar. The system itself seems to have been purpose built. Burnished copper and and quite unique, not looking like any other I've ever seen. It's my own opinion, but I've never quite liked the look of a blizzard of tap handle markers. 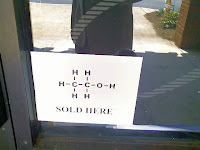 The overall effect is visually cacophonous, and even from a few feet away, a customer can't really read the labels. The owners at the Brickstore have substituted with unmarked short black handles. The effect is aesthetically pleasing, and a benefit is that the bartender must know his products. He tells you what's on tap - or hands you a well-written beer menu. Bartender Mike did both: very knowledgeable. In the photo, that's Simon on the left, a representative of Savannah Distributing, the wholesaler which sells Clipper City beer in Georgia. On the right, it's bartender Mike. Later we were joined by Grey Martin, the past Sales Manager for the Atlanta Brewing Company, and by Henry Monsees, the owner of Savannah Distributing. By that time, we had progressed to an 11% abv Italian Draco beer, served with an artisinal cheese plate (I only remember the Minorcan Mahon - tart, spicy, and piquant). We were all quite happy! The greater Atlanta metro area, by the way has quite the selection of good beer joints: Taco Macs, Summit Stations, Charlie Mopps, here, and many more. Bad yields for hops this year in Europe have driven up hops' price and critically decreased their availability. As a result, many non-US brewers have been purchasing a lot of the US harvest. Malt prices have likewise increased; look to that as a result of energy costs increases. The perceived wisdom in the craft beer industry has been that $9 was the highest that most consumers would be willing to pay for a standard 6-pack of craft beer. Talk is that the increased cost of ingredients will cause that ceiling to be broken in 2008. As I posted on an earlier blog, I don't steal music. I like to download music, but I don't like dealing with all the infuriating impedimenta strewn about by the mega-music conglomerates in the path of ease of use. DRM (digital rights management) is one such piece of junk, and is one reason why I disdain those services that employ it, and use the eMusic service instead. the digital music market has overlooked older music fans for far too long and that the time has come to start teaching old dogs new tricks. Although the assumption is that digital music is a format for young adults, studies show that older users are in fact quite active with new media. A December Ipsos TEMPO survey found 35- to 54-year-olds made up 31 percent of those users who paid for music downloads. When you include those 55 and over, adults beyond the age of 34 make up about 40 percent of all paid a la carte downloaders -- twice the proportion that teens account for. They also download more songs than average: nine per month compared with the average five across all generations. Here's an age group that is more willing to pay for music than younger fans and has mor e money to do so. So why has it been left out of the picture? For starters, the older demographic in general is less interested in new music. An April Ipsos survey found that 67 percent of music downloaders aged 34-54 say they look for older music not easily found in record stores, while 41 percent pointed to current hits. But those figures can increase dramatically when focused on niche genres like jazz or classical. Some of Blue Note's releases that don't get much placement in record stores experience 30 percent or more digital sales, far above the industry average. For Robert Glasper's "In My Element," released in March, 49 percent of its first-week sales, and 31 percent of its total sales to date, have been digital. Cellist Yo-Yo Ma's Sony Classics release "Appassionato" sold more digital copies than physical ones upon its release in January. It peaked at No. 2 on the iTunes sales chart and finished the first week with 57.1 percent of its sales digital; to date, 30 percent of its sales have been digital. "It's a tiny fraction (of digital music buyers), but they're people who buy a massive amount of music," Hochkeppel said. "O frabjous day! Callooh! Callay!”, I chortle in my joy! a social network and digital music store for fans of jazz and blues. What exactly that means, we'll wait and see. But step by step, inch by inch, kicking and screaming, the music companies seem to be turning away from silliness and towards emusic as a usable commodity. Read my earlier post on DRM and downloading music here. PS. I'm writing this blog while listening to Art Blakey's At the Cafe Bohemia via Last.fm. Get with it music conglomerates! PPS. And having finished yardwork and other chores, I'm drinking Lagunitas' Undercover Shutdown Ale. It tastes somewhat like a Clipper City Winter Storm, but done up stronger. More grapefruity in hop aroma than Winter Storm, but like it, copious crystal malts in the grist provide an amber hue and caramel backbone to the bitterness. It's named for a 'hoppy' party which got the Lagunitas brewery penalized by the California constabulary. Undercover is nearly 10% abv, but even so, I noticed a review on Beer Advocate which referred to it as a session beer. Now, that's simply wacky! Or more diplomatically, it's a claim to own a better liver or be a better man that I would ever want to have or be. It speaks to issues raised in earlier post of mine. The April 2007 creation of Coastal Brewing from the smelting together of Dominion Brewing with Fordham Brewing and Anheuser-Busch has been missing a crucial element in its own back yard. The Dominion plant is in Ashburn, near Dulles Airport. Dominion's beers have long been distributed by the Anheuser-Busch distributor network. And recently, the Anheuser-Busch Brewing Company, itself, purchased the rights to distribute InBev's portfolio of Belgian and other imported beers throughout the US. Virginia is a franchise state: once a wholesaler has been awarded the rights to distribute a brewery's beers, it retains them in perpetuity, unless both it and the brewery agree to part ways, and usually for 3 year's worth of gross sales! In northern Virginia, it is Premium Distributing/Reyes which owns the rights to InBev's beers, and it has not been willing to surrender them. Thus, I believe that northern Virginia is one of the only areas in the US where the A-B network does not have the rights to InBev's distribution. I have been told that an agreement has been reached between Anheuser-Busch and Premium Distributors/Reyes Holdings. It has something to do the resolution of an issue between the two in California. As a negotiated trade-off, Premium will sell its rights to InBev products to the two Anheuser-Busch distributors in northern Virginia as early as September. There'll be some hefty compensation to be paid to Premium, but the invisible banker will be Anheuser-Busch itself. I'll respect my source's request for anonymity. 30 years running this year, the Great British Beer Festival is held annually in London, UK at the start of August - a festival and competition celebrating British cask ale. The winner is crowned Supreme Champion Beer of Great Britain. It's the largest cask ale festival in the world. The requirement that beers entered must be cask-conditioned (for the most part) puts large and small breweries on a level playing field. Instead, the US organizers have added categories for mainstream NAILs and ILLs, and a multitude of other craft and import directed categories, many identified by hair-splitting differences. In fact, the current list approaches formalism, with 69 different categories, some merely based on brewing procedures. It might be a tautology, but it is the answer to the question "How does the beer taste?" which really matters when we taste beer. The brewing procedures followed to reach that point are interesting and vital, but it's the end result that we drink. Now, compare the American Festival with the British Festival: 69 categories for the former, merely 8 categories for the latter, with the eighth being best of show. With so many fewer categories, might success be grander of an achievement at the British fest? 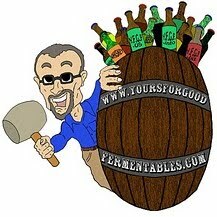 Now, check out Rate Beer.com and Beer Advocate.com. These are two of several on-line communities of US beer drinkers-as-reviewers, whose memberships' overriding bias is toward more alcohol, more hops, more bigger-ness. It's almost as if US beer aficionados are afflicted with mass sinusitis that eschews perception of subtlety or beauty. So what beer was awarded overall Gold at this year's Great British Beer Festival? Mild is not a condition, but a style of ale that is full-flavored and dark, and is brewed to less than 4.5% abv, and in this case of the 2007 champion , to only 3.2%! Such a mild ale could never win the collective accolades of many US beer fans. It might find the going likewise arduous at the Great American Beer Festival. But at the Great British Beer Festival, there was no Hobson's choice (a choice that really is not a choice), but a clear and resounding acclamation. It was this little beer, this session beer, this Hobson's Mild, that vanquished big braggadocio. Hobsons Mild from Hobsons Brewery in Shropshire was today judged [11 August] to be the best beer in Britain by a panel of brewers, beer writers and journalists at the Great British Beer Festival at Earls Court. The Shropshire brewed beer was chosen as the overall winner from over fifty finalists in eight categories including beers from tiny micros to major regional brewers. Nick Davis, Director of Hobsons said: “What a great surprise! It's a nutty mild and despite being only 3.2% abv, it's packed full of flavour." How I once was fortunate to taste a (likewise small) Champion cask ale. Lew Bryson preaches on small beer. Swinging against the Kansas City Royals, New York Yankee Alex Rodriguez hit his 500th home run this afternoon. It ended a long (for him) slump. By a few months, he's the youngest player to reach that number. Barry Bonds remains stuck at 754 home runs, one behind tying Hank Aaron's all-time home run record. Later Saturday evening, Barry Bonds did hit #754. In an irony, he did it against a pitcher who himself, a few years earlier, had been caught using steroids: Clay Hensley of the San Diego Padres. Beginning Monday, the Washington Nationals play 4 straight against Bonds and the Giants in San Francisco. The photo, above, is of beer, travel, and baseball writer Charlie Vascellaro at the Belgium Comes To Cooperstown Festival at Brewery Ommegang in late July. He was vamping for the photo. Was he looking for Bonds' 756th, I quipped. After I snapped the picture, Charlie and I had a strong-beer-fueled discussion. Or more precisely, I should say, he delivered an amazing lecture on whom he considered the greatest ball player ever. He narrowed it between Hank Aaron and Babe Ruth. And then whom of those two? You'll have to ask Mr. Vascellaro! Here's the story of how I accidentally became Granville Moore's first ever customer. 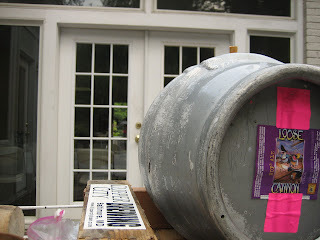 Well, she told me, Chris Surrusco at Granville Moore's needs a keg coupler for one of his Belgian kegs. His pub's soft opening was set for later that day. Would I turn around, head a few miles north to the distributor's warehouse, pick up the coupler, and deliver it to the pub in NE DC, she asked? Most Fridays, I'm scheduled for in-store demonstrations or beer events of some sort. By fortune, not so this Friday. And Clipper City's brewery is not far from the Maryland warehouse for Legends, Ltd. So I acquiesced ... and that's how I soon found myself in Granville Moore's at 3:30pm, shortly before the opening. Chris thanked me with a bolleke of De Koninck. For an August afternoon in Washington D.C. - 96°F, humid, and an unhealthy air alert - this low-alcohol Belgian draft was anodyne refreshment. In addition to the De Koninck on the draft tower, Chris had Stella Artois (pays the bills! ), Urthel's Hop It (a hoppy Belgian ale), and St. Feuillen Tripel. I didn't stay for the actual opening - I had a few more work-related stops scheduled for that afternoon. 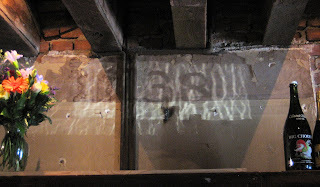 But I did take the time to stroll around and observe how the pub had come together since May when I had last visited. Form follows function: Granville Moore's Frittes, Ales, & Moules is in an old and narrow rowhouse. It's cozy, yes, but commodious, it's not. So Chris will only have those 4 taps; but two will be rotating taps, that is, on which he'll move through small batch Belgians. He'll stock a bottled list of in excess of 65 Belgians. Belgian beers come many miles often from small output breweries. We here on the east coast of the US are very fortunate that we can often sample those beers. But sometimes that familiarity leads beer fans to always expect to have them on hand. Chris does not. He is willing to creatively deal with different availabilities and recurring un-availabilities. I appreciate that sensibility. By the way, Chris is a hophead. So he'll always have an American IPA available in bottle. But you'll have to ask for it; he's keeping it unlisted, sub rosa. It looks as if some things remain to be completed, but the overall effect is that of Chris' conception of a rustic Belgian brasserie. The kitchen seemed a hive of activity so I didn't peek in there. Chris began with the idea of a very limited menu: moules done 5 ways, double-fried frites, a grilled sandwhich or two. As you can witness from the menu, his chef, David Nugent, has aggressively expanded upon that concept. Even so, Chris assures that the prices will be reasonable, or should I say, brasserie-esque. And then another surprise: Chris' bartender walked in, and it was Chris Frazier, now a former brewer for the Old Dominion Brewing Company. 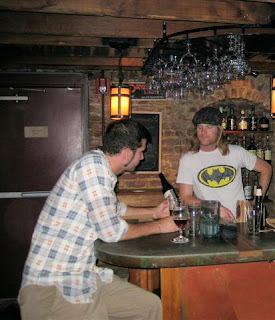 He told me that he would also be bartending at the soon-to-open Dogfish Head Alehouse in Falls Church, Virginia. What's up with Coastal Brewing/Dominion/Fordham? Well, that's another story. More photos here. Also, here's a story on co-owner Joe Englert, who is the wizard behind several DC pubs and several along H Street NE. I returned today during regular hours (6pm on) with friends. I had a delicious draft Urthel Hop-It (earthy and spicy aromas, that is, not US-style grapefruity hoppiness) served in a branded goblet. -Seared Georges Bank Scallops w/ Bacon & Corn Ragout. -Arugula Salad w/ Kriek Swelled Dried Bing Cherries, Point Reyes Bleu, Toasted Walnuts, Red Onion. -Belgian Endive Salad w/ Asian Pear, Fresh Coconut, House Tweaked Ginger, Mint. -choice of 8 different sauces: Roasted Garlic Aoli, Heinz Classic, Cucumber Raita, House Smoked Red Pepper Catsup, Wholegrain Studded Dijonaise, and 2 tbd. -House Ground Angus Burger w/ Homemade Pickles & Frites. -Croque Monsieur w/ Organic Farm Egg, House Smoked Taso, Gruyere, & Frites. -Grilled Organic Vegetable Sandwich w/ Belgian Ale Washed Chevre & Local Greens. -Belgian Tripel, Toasted Elephant Garlic. -Preserved Lemon, Black Olive, & Harissa Broth. -Applewood Smoked Bacon, Braised Leeks, Parsley, & Cream. -Tamarind, Lime, Cilantro, Palm Sugar, & Thai Chili. *** all moules served w/ frites, 1 sauce. -Exotic Mushroom Risotto w/ Parmigiano-Reggiano and Fresh Thyme. -Grilled Pacific Snapper Filet w/ Heirloom Tomatoes, Poached Fennel, & Saffron Broth. -Natural Chicken Breast w/ Toasted Israeli Couscous, Cerignola Olives, & House Preserved Lemons.